Home / Aloha News / Jandals: What Are They? Jandals. It’s a term meant to describe a sandal: that much we know. But it’s a contraction of “sandal” and what, exactly? Some will claim that Jandals are “Jesus sandals.” Others claim they’re the less holy “jail sandals,” while a third group argues that “jandals” is a contraction of “Japanese” and “sandals.” Is it one? All three? It’s time to settle the debate once and for all. Let’s start with the Jesus style sandals. These are a good contender for the term Jandals. These bad boys really do look like ancient relics from olden times. These are made by Pali Hawaii, though they have taken off in popularity all over the mainland, and if you take a college tour you’ll be sure to see many twenty-somethings sporting these simple shoes. The most popular styles are usually understated brown shades but Pali Hawaii Jandals are also available in many bright shades as well. They’re made with a soft, flexible plastic and because of this are completely waterproof. You can’t walk on water with these, but you can walk in water and not worry about getting your shoes wet. But are Jesus sandals the real Jandals? We’ve all seen movies and tv shows depicting sad, shuffling inmates wearing orange jumpsuits and thick-soled, slipper-like sandals. Some might say that “Jandals” refer not to flip flops inspired from Japan nor to Jesus-style sandals, but to something altogether different: sandals inspired by convicts. Jandals in this context does not refer to a specific style of shoe necessarily, but refers to any sandal worn by prison inmates. For example, some jandals might have two straps while some would have just one, like a pair of slides. Jail sandals are also a bit different in structure to the other Jandals discussed here. They are usually made from a soft EVA foam (a synthetic, soft and squishy flexible plastic foam), making them comfortable to walk on. They’re also waterproof, odor proof, wear-resistant, and slip-resistant. Better than all of this though, is the fact that these shoes cannot be used as a weapon by prison inmates---they’re hard to cut through, and too soft to cause any harm. Modern “jandals” in this regard are quite the step up from the prison uniforms of old. In the 19th century, before national prison standards and dress codes, prisoners often were not issued footwear at all, instead being forced to walk everywhere barefoot. 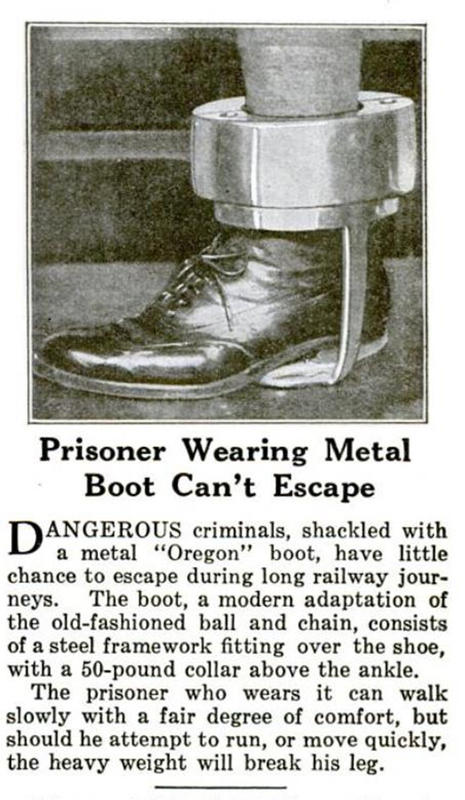 In Oregon in the 1860s, prisoners were forced to wear the brutal “Prison boot” or “Oregon boot,” which was a work boot with a 50 pound weight attached from the sole of the shoe to the prisoner’s ankle. While the papers at the time claimed this contraption had “a fair degree of comfort,” it left several prisoners with permanent limps and other damage. Though modern "jail sandals" are actually quite comfy, this version of "jandals" are decidedly less popular than Pali's Jandals and the classic flip flop, but who knows? If the Crocs had their moment in the sun, maybe jail sandals will too. So let’s review. Kiwis from New Zealand claim that not only did they invent the term “jandal,” it doesn’t identify to a typical sandal at all, but rather the classic Y-strapped flip flop. Young people, among whom the Pali Hawaii copyrighted Jandal has become a closet staple, claim that these Jandals are the one true Jandal. Whatever the case, we have our own opinion. Jandals are Jesus sandals made by Pali Hawaii. They’re perfect for bringing to the beach, and if you get a pair in one of the bright colors they offer, you won’t lose them in the sand or surf. Plus, their rising popularity means that you can go from surfing to shopping without changing your footwear. The flexible plastic is comfy and won’t break or rip. Flip flops aren’t Jandals, they’re flip flops over here in the US. Get with the program, New Zealand! And we don’t really want to show off our new shoes if they’re called jail sandals. We prefer Jesus sandals. But that’s just us. Whatever you think of when you think of Jandals, we hope you go on the best adventures with them.